(CNN) -- The Polish president on Saturday signed his country's ratification of the Lisbon Treaty, aimed at streamlining the workings of the European Union. Polish President Lech Kaczynski holds the EU's Lisbon Treaty in Warsaw on October 10. President Lech Kaczynski's approval of the treaty leaves the Czech Republic as the lone country that has not ratified the document. 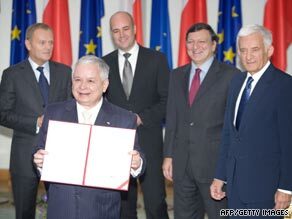 Kaczynski signed the treaty at a ceremony attended by EU officials in Warsaw. He had refused to sign the document until it was ratified by Irish voters in a referendum. They backed it by a wide margin on October 2. "I am certain that the union will function even better with the treaty of Lisbon," Kaczynski said Saturday, in an excerpt of his remarks provided by the Swedish presidency of the EU. The treaty would create an EU president and foreign minister and introduce rotating representatives for member countries in the EU Commission, the union's executive branch. All member states have to ratify the treaty before it can be adopted. "The Czech Republic must conclude their ratification process by the signature of President Klaus. Europe is waiting impatiently," Swedish Prime Minister Fredrik Reinfeldt said, according to the Swedish presidency. The Lisbon treaty is undergoing review in a Czech court, which will determine in a few weeks whether it is compatible with the nation's constitution. Czech President Vaclav Klaus must also sign it. On Friday, Klaus outlined his objections to the treaty, saying at a news conference that "the Lisbon Treaty constitutes a fundamental change for the Czech Republic. "As you know, I have always considered this treaty a step in the wrong direction," he said. "It will increase its democratic deficit, worsen the standing of our country and expose it to new risks -- among other things also because it endangers the legal status of the citizens and the stability of property rights in our country," he said. He said he was particularly concerned about one section of the treaty, called the Charter of Fundamental Rights of the European Union, which concerns fundamental human rights, including property rights, for EU citizens. "On its basis, the Luxembourg Court of Justice of the EU will assess whether the legal provisions, customs and practices of the EU member countries comply with those of the charter," Klaus said. "The charter makes it possible to reexamine even those decisions of the Czech courts that are legally binding," he said. He said he feared the treaty would make it possible to raise property claims related to the expulsion of Germans from Czechoslovakia following World War II. The last Czech government did not pay enough attention to this possibility, he said, and did not negotiate an exemption from the charter, which Poland and the United Kingdom have, he said. "Before the ratification, Czech Republic must at least ex post negotiate a similar exemption," he said. "I think this exemption can be solved quickly." Klaus spoke with Reinfeldt by phone on Thursday about the treaty. "This sends the wrong message at the wrong time," Reinfeldt said afterward, his spokeswoman, Roberta Alenius told CNN. Czech Prime Minister Jan Fischer said in a Friday statement that he had seen Klaus' concerns, and said that he regretted that the president did not consult with the government beforehand. "I remain convinced that the Czech Republic will bring the ratification process of the Lisbon Treaty to a successful conclusion, so that it can enter into force by the end of the year," he said.